There are no signs of slowing down as long as advancements in the field of technology are concerned. It was during the initial period of modern civilization that people invented, developed and kept on incorporating brand new techniques of accomplishing regular tasks. Presently, as technology and its different advancements starts shaping and influencing our lives, it’s indeed alarming to imagine what’s in store for our future. From augmented reality to cloud computing, there is other advancement in the field of technology which has dramatically altered the way in which we get access to information and communicate with each other. Given the scenario in the business industry, there are lots of tech startups that are popping up everyday. The startup business firms have adopted all such emerging technologies in order to drive fuel innovation, develop new products and rekindle new partnerships. Here are few of the breakthrough technologies that all business startups should take into account. With the recent advancements of machine learning and artificial intelligence, there has already been a heated debate. Since sci-fi has now become a stark reality, artificial intelligence has invaded both our workplace and home. It not only helps us in automatically answering mails but it also lets us create a customized experience of shopping and is revolutionizing the way in which we work and live. The tech giants like Apple and Google have employed Artificial Intelligence systems to respond to queries and data inputs. On the other hand, startups like Motion AI have already designed Chatbots which have the ability of responding to complicated workflows. The Internet of Things brings automation, mobility and data to create a strong network of devices like washing machines, coffee makers, cars and wearable objects. As Wi-Fi enabled and broadband supported devices become more and more common, there will be an estimate of 35 billion gadgets connected to the internet by 2020. Non-conventional devices are predicted to account for 25 billion and traditional devices are expected to represent around 10 billion devices. 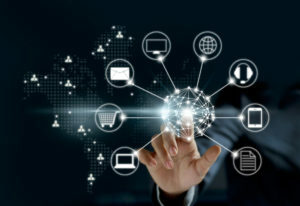 As billions of interconnected devices communicate with each other, data and security management are crucial components of digital infrastructure. It is not many days ago that Equifax announced it encountered with data breach where 145 million consumers were compromised and their vital information like birth dates; Social Security numbers and addresses were hacked. When biometrics is used as a key means of identification, the risk of being subject to large-scale data breach helps you protect all sorts of critical data. As protection and security has become more important than ever before, commercial use of biometrics has even expanded in late years. During the time when Facebook purchased Oculus VR, it was only virtual reality which was predominant in the online marketplace thereby boosting the expectations of the investors and consumers. In fact, as per ABI research, more than 100 million people will have headsets powered by virtual reality by the end of 2020. VR technology has now set an influence on market way beyond entertainment, media and gaming. Moreover, we are fortunate enough to note that virtual reality has delivered some promising innovations in the field of healthcare and is even transforming the way in which police react to community violence. Therefore, if you’re someone who is upgrading yourself with the new advancements in technology, you should always take into account the above listed startup tech trends to adopt in 2017 and beyond. Don’t let your competitors consume your share of competition.